It’s nearly the end of the first month of 2016! 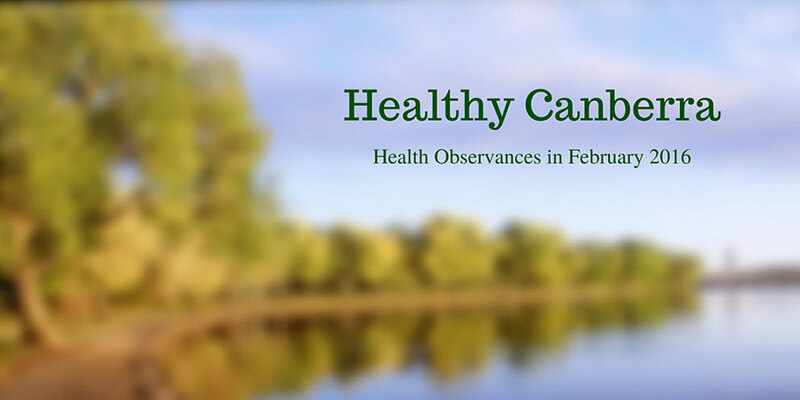 Like we always do at the end of the month, we’re rounding up some health-related observances happening here in Canberra next month, and we encourage you to take part and to spread the word in whichever way you can. Below are the list of observances as we welcome February 2016. This observance aims to raise awareness of ovarian cancer and to recognise women, their families and friends affected by ovarian cancer. A range of activities and events are held throughout the month of February. Visit their website to find out the activities listed or like their Facebook page and share the news to your friends. A grim fact: every 27 minutes, an Australian is killed by heart disease. Red Feb Month aims to raise awareness against the No. 1 killer of Australians — heart disease. Organised by the Heart Research Australia, Red Feb Month holds several activities to help raise funds that will impact the way heart disease is prevented, diagnosed and treated. Visit their website to learn how you can take their “Get Active” Challenge, participate in the “Wear Red Day” (26 Feb) or get to know the plenty ofways to raise funds for heart research. Cancer affects everyone in different ways — but we have the power to take various actions to reduce the impact that cancer has on individuals, families and communities. World Cancer Day, which happens on February 4th, is a perfect opportunity to reflect on what you can do, make a pledge and take action. Visit Cancer Council ACT to learn more. Make your Valentine’s Day celebration heart-friendly by participating in the activities organised by Heart Research Australia to raise awareness to help beat heart disease. Learn more here. Weight gain is one of the risk factors in developing cardiovascular diseases so it is important to watch your weight—and it all starts with the food we eat and drink. Healthy Weight Week, an initiative of the Dietitians Association of Australia, is a fantastic opportunity to raise awareness of the importance of achieving and maintaining a healthy weight and lifestyle.Visit their website to learn some healthy recipes and find an event near you.